Shaheen's highest qualification before joining CLL was GCSEs, now she is a Graduate of both the 2 + 2 Social Studies undergraduate course and MA in Career Development and Coaching Studies. She previously worked in factories, schools and run her own business. After marrying at a young age, Shaheen felt like A-levels and University were no longer an option to her. However, when her marriage broke down later in life, she decided she wanted to pursue a different path and wished to take up the opportunities she missed out on. "I still had the passion for learning and felt that I had missed opportunities to gain qualifications on the Higher Education front." She says. Shaheen researched courses in the area suitable for mature students, that could fit around family and other commitments. A career guidance worker suggested the 2 + 2 social studies course. "I was apprehensive because I had only GCSEs and no A-Levels but went for it anyway. I was given an unconditional offer after my interview and my journey of eight years in higher education started." After graduating, Shaheen went on to study at postgraduate level, starting the Careers Development and Coaching Masters . The programme provided her with an insight into the changing nature of paid work, the shifting world of careers and employment. "It has given me a foundation to build further knowledge of the labour market and help to guide others into meaningful employment and education." 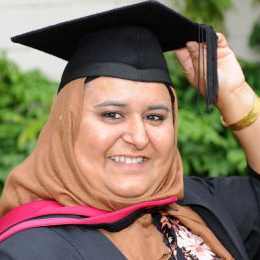 Since graduating with an undergraduate and masters degree, Shaheen has worked with vulnerable people in various roles including; a mental health support worker, healthy minds support worker and spearheading a domestic violence and forced marriages unit. She is currently working as a civil servant and mental health first aider. "I’ve learned that it is never too late to learn, and my brain can retain information and I can get out of my comfort zone to achieve my dreams. I have extended my own chances of getting roles in different employment sectors and become a good positive role model for my children."